The newsletter of Christ Episcopal Church in Valdosta, GA. The Gabard Building was dedicated in July, 2012, on the final Sunday of the Rev. Peter L. Ingeman's 12 years of service as our rector. Episcopalians lived in Valdosta from the 1860s on, worshiping in private homes or the Lowndes County courthouse before construction of Christ Church at 309 East Central Avenue in 1885. The cornerstone was laid in November 1885, and Bishop Edwin Gardner Weed of the Diocese of Florida consecrated the building in 1887. Until deconsecration on December 7, 1947, the original Christ Church was home to local Episcopalians. From 1885 to May 11, 1954, it also was a mission church dependent upon the Diocese of Georgia for financial support. Among significant developments at old Christ Church was the Rev. Gilbert A. Ottman’s founding the first Vestry in 1900, with J.L. Staton as Senior Warden and Charles Thompson as Junior Warden. The choir originated in 1901, and, at the same time, Charles Thompson, the organist for fifty years, sold the old reed organ and purchased a new one. In 1910, Christ Church built the first vicarage, often called the “Rectory,” at 115 West North Street. The “Rectory” housed the Church’s priests until the Vestry obtained 2200 Glynndale Drive from Dr. S.H. Story in December 1963. The Glynndale Rectory served through 1994, when the Rev. Henry I. Louttit, Jr. moved to Savannah to become Bishop of Georgia. Communicants made many improvements to the old church building, including enlarging the structure twice, in 1912 and 1940. Other changes included installing electric lights in 1901, putting in another new organ in 1911 that lasted until 1940, and placing gas heaters in the church in 1935. A reredos went up behind the altar in 1938, and new electric lights replaced the old ones at that time. Vestry bought carpet for the floors in 1940 and acquired another organ that later went into the new church during its 1948-1949 construction. Between 1885 and 1917, Christ Church had nineteen short-term vicars. The Rev. Joseph J. Cornish arrived as Vicar in March 1917 and remained fifteen years until retiring in 1932. Since the start of Fr. Cornish’s tenure, Christ Church has had only nine fulltime ministers. The first home-grown priest was the Rev. Clifton Huntington White, a professor at Georgia State Womans College. The nature of his clerical training is now unknown, but Vestry recommended him for ordination as transitional deacon on March 4, 1945, and he was ordained on April 29, 1945. Ordained priest on March 16, 1946, he succeeded the Rev. Thomas G. Mundy as Vicar on June 26, 1946. The last Vicar and first Rector was the Rev. Michael Joseph Kippenbrock, who was at Christ Church from May 1, 1953, until September 30, 1963. The Rev. Henry I. Louttit, Jr. had the longest tenure, from April 1, 1967, to December 31, 1994, when he became the Ninth Bishop of Georgia. Christ Church was land-locked on East Central Avenue, and during World War II, Vestry tried to prepare for post-war expansion by acquiring an adjacent lot and agreeing to pay the landowner’s asking price. The transaction apparently failed, so, after the war, Vestry decided to find “a new site for the Church itself. . . .” The outcome was the purchase from the J.F. Holmes family of a North Patterson Street lot directly across from Georgia State Womans College. Vestry soon sold the old church to Christian Scientists for $12,500.00. John Courtenay LeBay, eminent Savannah architect, planned the new structure, incorporating elements of Bruton Parish Church below the tower and basing the tower on a seventeenth century design by Sir Christopher Wren. Tinker Concrete Company of Macon did the construction work and finished in time for the first service to be held on February 20, 1949. To complete the project, Vestry borrowed $15,000.00 from a Mrs. Simpson to pay for the Parish Hall, also erected by Tinker Concrete. The structure was smaller than presently and did not have the area now containing the kitchen, serving area, and first row of tables. In 1953-1954 Vestry borrowed $9,000.00 from the American Church Building Fund Commission to construct a “Sunday School Annex” attached to the rear of the Parish Hall. Completed in 1954 and named Barnwell Hall by Vestry in December 1960, the Annex contained six rooms for Sunday School classes until major renovations in 1980-1981. The “new kitchen” then replaced Barnwell Hall and still serves. The Rev. Michael J. Kippenbrock became Vicar on May 1, 1953, and led Christ Church through the Barnwell Hall project and through the process of reaching parish status in 1954. The request to become a parish was to be considered by the Diocesan Convention in May 1954 and, expecting its approval, Vestry voted to call Fr. Kippenbrock as the first Rector. He accepted by letter on May 15, and confirmed that Convention had consented to parish status on May 11, 1954. Later, again needing Sunday School space, Vestry purchased 103 East College Street in December 1958. Named Stuart Hall by Vestry in December 1960, the building accommodated both a kindergarten and Sunday School rooms. In 1968, early in the term of the Rev. Henry I. Louttit, Jr., Stuart Hall underwent an extensive revamp, costing $56,000.00, to create office space, new classrooms, and a cloister walk to connect the building to the Church. The last major development of Fr. Kippenbrock’s tenure was renovation of the church itself in 1963 that gave the building the appearance that endured until the major alterations of 1980-1981. Soon after, Kippenbrock resigned and became Vicar of All Saints Church, Enterprise, Florida. After a long search, the Rev. Brevard Williams became Rector on August 1, 1964, but remained only to September 1, 1966. Henry Louttit, formerly Vicar of Trinty Church, Statesboro, Georgia, began his long stint at Christ Church on April 1, 1967. Louttit was deeply interested in “liturgical renewal” and was associated with the creation of the 1979 Book of Common Prayer. Christ Church, during the 1970s, participated widely in using the trial services that preceded introduction of the new prayer book. He was involved in the arrival of Cursillo in the Diocese of Georgia. In addition, Fr. Louttit saw considerable potential for a new Episcopal church to be established on the north side of Valdosta. To that end, he played a major role in founding St. Barnabas Episcopal Church in 1982, and many of its original members were previously communicants of Christ Church. Fr. 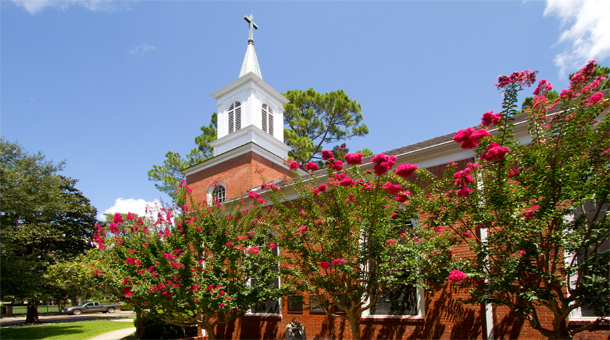 Louttit was also instrumental in the move of an Assembly of God congregation in Valdosta, now Christ the King, to the Episcopal Church in 1989. After the closing of the original Christ Church preschool program, he re-established the Preschool in 1983 and placed it in the Irene Miller House, bought in 1979 along with the Thomas Bray House (to add Sunday School rooms) and other space on North Patterson for parking. In 1976, Christ Church had also acquired property on East College Street east of Stuart Hall. A major event was the 1980-1981 reconstruction that notably altered the appearance of the Church itself, opened new seating space on the south side of the Church, built a new kitchen in what had been Carswell Hall, and made various improvements to the Parish Hall. Also, the Sarah Oliver house on North Patterson Street became Christ Church’s property, and while initially used as office space, it is now the Rectory. Following Fr. Louttit’s election as Bishop of Georgia and his consecration on January 21, 1995, a search for a new Rector brought the Rev. David Francouer to Christ Church. However, he stayed only a short time. The Rev. William Harris from Tallahassee then served as Interim Rector, and a new search re-introduced the Rev. Peter Lyle Ingeman to Christ Church as Rector on June 1, 2000. Fr. Ingeman already was known here, having served as Assistant Rector in 1987-1989. He also had been ordained priest at Christ Church on June 6, 1987, by the Right Rev. Harry W. Shipps, Eighth Bishop of Georgia. During his twelve years and two months as Rector, Christ Church acquired the house on North Patterson Street that is now Louttit Hall. An important administrative reform was the introduction of a new bookkeeping system and a new bookkeeper and the establishment of strong financial controls and safeguards. Fortuitously, an opportunity arose to purchase a great organ from All Saints Church, Atlanta, at a bargain price. This acquisition also required physical expansion of the Church eastward to make room for the pipes, which was done. Significantly, a Vestry retreat on March 17, 2007, established a Facilities Planning Committee that worked for five years on expansion of the physical plant, which resulted in construction of the William M. Gabard Education Building. This magnificent structure was dedicated on the last Sunday in July 2012, Fr. Ingeman’s final Sunday, providing thereby a glorious climax to Fr. Ingeman’s productive dozen years as Rector. This entry was posted in History of Christ Church on May 3, 2013 by jariail. Hours: Monday-Friday, 9 a.m - 12 noon, 1-3 p.m.